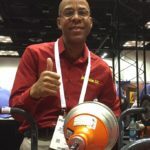 Reputation, reliability and results mean much to Vincent “Vinnie” MacDonald’s Boston-area drain cleaning business. So do the right tools. That’s when Vinnie MacDonald’s Rooterman technicians flew to the rescue. The New England pros diagnosed, pinpointed and solved the problem by teaming three pieces of General Pipe Cleaners equipment – a Gen-Eye® video inspection/location system, a Rodrunner® sectional cable drain cleaning machine and a JM-3000™ gas-powered water jet. Weighing just 90 lbs., Rodrunner® is a light weight, powerful sectional machine capable of clearing heavy stoppages and roots in lines over 200 ft. long. General’s versatile Rodrunner® can either be run “lawn mower” fashion, as the self-feeding cable screws into the line – or in tight spaces, operated in “up close” stationary position. “It gives fierce boring power, and works sludge really well in long lines,” MacDonald maintains. But it couldn’t handle all the sludge. So that’s when the Rooterman crew fired-up their JM-3000™ water jet to clear the remaining debris. 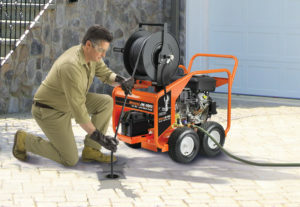 Built for heavy use and abuse, the powerful JM-3000 – part of General’s Jet-Set® range of gas and electric powered water jets – is great for clearing large lines and long runs. 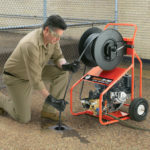 A heavy-duty 3000 psi, 4 gpm pump is driven by a reliable 389cc (13hp) Honda engine with electric start through a 2:1 gear reducer to extend pump life. On-demand Vibra-pulse® helps propel the hose around tight bends and further down long lines. “Our JM-3000 cleaned the line so we finally spotted the real problem!” MacDonald says. Rooterman’s Gen-Eye® video pipe inspection system revealed that the line had actually broken and separated under the street. “Pinpointing the exact problem led to precise repairs – fixing that ‘unsolvable’ puzzle for good!” Vinnie MacDonald proudly recalls. Available in a variety of models, Gen-Eye® systems offer drain cleaning professionals everything necessary to trouble-shoot 2” through 10” lines. 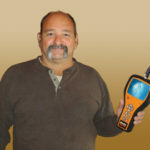 And with General’s new, easy-to-use Gen-Eye Hot-Spot® digital pipe locator, professionals can pinpoint the target quickly. In fact, the Rooterman franchisee credits expert service and General tools with boosting his profitability.